Iowa; September 2006. Permission of Sharyl Ferrall, IAGenWeb volunteer; all rights reserved. H. R. & E. A.
Anna Amelia C. Fiegenbaum was born on 26 November 1861. She was the first child born to Heinrich Rudolph Fiegenbaum (1837-1908) and his first wife, Elizabeth Ann Krümpel (1837-1877). Very few details of her short life are known. What can be surmised is based on the sketchy historical record of her father's career in the German Methodist Episcopal Church. Ministers in that church received new appointments every few years. In addition, the growth of settlements in the 19th century required the church to revise its organization structure from time to time. I think Rev. Fiegenbaum's wanderings were not solely the consequence of his membership in the Methodist Church. There was something in his nature that would not let him settle down. In the last decade of his life, he was living on the west coast, in Washington and Idaho. On 28 January 1860, Anna's parents were married at Colesburg, Delaware County, Iowa. In July of that year, at the time of the 1860 U.S. census, they were living in the home of Heinrich Rudolph's parents in Wapello Township, Louisa County, Iowa. In 1861, Rev. Fiegenbaum had been appointed to the Upper Iowa Conference of the Methodist Church. Exactly where his circuit of congregations was located is not known. Anna was born in November of that year; her birth place is not known either. Between 1862 & 1865, Rev. Fiegenbaum served the Colesburg, Iowa, District of the church. Anna's sister, Emma Lorena, was born on 20 April 1863. A few months later, in June, Heinrich Rudolph, identified as a married minister residing in Colony Township, Delaware County, Iowa, was enumerated in a Civil War draft registration conducted in the Third Congressional District of Iowa. In 1864, Rev. Fiegenbaum had been appointed to the Northwest German Conference of the Methodist Church. Between 1865 & 1867, Rev. 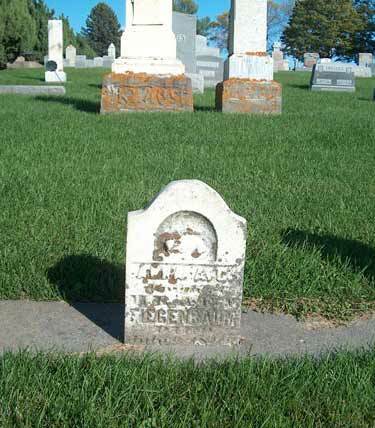 Fiegenbaum served at Platteville, Grant County, Wisconsin. A new church was built in 1866. His charge may have also included Stitzer, in Grant County. Between 1867 & 1870, Rev. Fiegenbaum was appointed to Charles City, Floyd County, Iowa. The circuit involved serving Albert Lea, Feeborn County; and Blue Earth, Fairbault County, in Minnesota; Esterville, Spirit Lake, Peterson, Fort Dodge, Eagle Grove, Forest City, Webster City, Alden, Iowa Falls, Hampton, Waterloo, and Decorah, in Iowa. The Flood Creek congregation was also part of this appointment until 1869. Anna was presented with two brothers: William Henry (19 March 1867) and Charles Herman (22 October 1869). At the time of the 1870 U.S. census, the Fiegenbaum-Krümpel family was living at Charles City, Floyd County, Iowa. According to the enumeration, the household consisted of Henry R. Fiegenbum [sic], age 33; born in Missouri; a clergyman; Anna E. Fiegenbum, age 33, born in Hanover, keeping house; Emma S. Fiegenbum, age 6, born in Iowa, attending school; William H. Fiegenbum, age 3, born in Iowa; and Charles H. Fiegenbum, age 9 months, born in October in Iowa. Also in the household was Martha J. Evans, age 16, born in Iowa, attending school. I do not know why Anna, the eldest child (she would have been a few months short of her 9th birthday), was not included in this household. On 10 July 1871, Anna received another brother, Arthur Frederick, born in Iowa. For an unknown amount of time beginning in the spring of 1872, Heinrich Rudolph Fiegenbaum served as financial agent for Charles City College (in Floyd County, Iowa). Anna Amelia C. Fiegenbaum died on 9 July 1873, at the age of 11 years, 7 months, 13 days. She was buried in Zion Cemetery, in Colony Township, Delaware County, Iowa. Sharyl Ferrall, coordinator for the Allamakee County & Clayton County sites for IAGenWeb, submitted the original of this photo to the IAGenWeb Gravestone Photo Project and has graciously allowed a copy to be included here. Sharyl noted that Anna Amelia's is one of six gravestones in a row that have been re-set in concrete. Just to the left of Anna's stone is the marker for Anna G. Schenke (died 16 February 1886). To the right of Anna's are the gravestones for Mary Alice Klaus (died 3 July 1862), Charles H. Klaus (died 9 May 1866), Infant daughter Klaus (died 20 August 1867), and Benjamin J. Klaus (died 24 February 1872). These last four graves are probably the children of Herman H. and Katherine M. (Krümpel) Klaus (see the biographical sketch of Herman H. Klaus, published in The History of Delaware County, Iowa... (Chicago: Western Historical Company, 1878), page 611). Anna Amelia's mother was Elizabeth Ann (Krümpel) Fiegenbaum (see the brief genealogy, below). If or how she and Katherine M. (Krümpel) Klaus were related to each other is not known to me at this time, even though it seems very probable. Just behind Anna's stone in this picture can be seen parts of two markers for John D. Klaus and Elisabeth Klaus (her maiden name was Hartbeck, Hartbecke or Hartbecka, depending on who is telling the story). John's biographical sketch was also published in The History of Delaware County, Iowa... on page 611. One of John & Elisabeth's daughters, Mary Malvina Klaus (1853-1930), was married to Rev. Frank Henry Wellemeyer (1848-1909). Frank H. Wellemeyer's mother, Christine Elisabeth (Fiegenbaum) Wellemeyer, and Anna Amelia's father, Rev. Heinrich Rudolph Fiegenbaum, were siblings; Frank H. Wellemeyer and Anna Amelia C. Fiegenbaum were first cousins. Frank Henry Wellemeyer, his father, Henry Frank Wellemeyer, and his uncle, Heinrich Rudolph Fiegenbaum, were all pastors in the German Methodist Episcopal Church. This association is no doubt how the Fiegenbaum, Wellemeyer and Klaus families became acquainted. If or how Herman H. Klaus and John D. Klaus were related to one another is another question that awaits resolution.